As clichéd as the saying may be, it’s true: you don’t get a second chance to make a first impression. And when it comes to job interviews, that first impression can make or break your chances at landing the job. So, you’ll want to do everything you can to make a positive (and lasting!) impression. To do that, follow the 10 tips below. 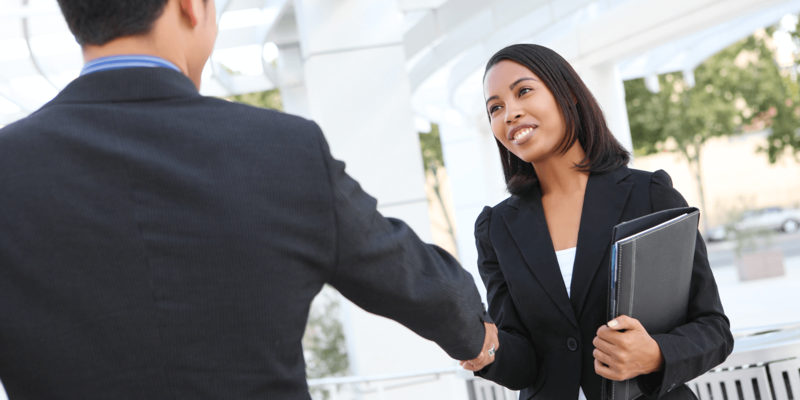 These can help make your job interview introduction a successful one! The way you stand, sit, walk, and look around all make an impression (favorable or not) upon the people you come in contact with. Try to exude confidence as a job candidate — even if you’re not feeling it—by standing up straight, walking at an even pace, and controlling any nervous jitters. A great way to exhibit confidence is by making strong eye contact. When you walk, make friendly eye contact with people (and not the floor), and when you’re speaking to someone, try to look into their eyes. Obviously, eye contact can turn creepy pretty quickly if you stare too intensely, but looking people in the eye shows that you see them, and more importantly, that you’re listening to them. Small gestures can go a long way in creating a positive impression of you. So if you’re offered something (such as water or some other refreshment), try to be gracious in your response. From holding the door open for others to helping someone pick up dropped papers, these small gestures can go a long way in impresssing a potential employer.